With nearly all of Warped’s cigars being produced by the Fernandez family at their famed TABSA factory in Estelí, it was only natural that the two entities would eventually collaborate. The first such effort came in the form of Warped’s Futuro brand, introduced in 2015. Now, Kyle Gellis (owner of Warped Cigars) and Max Fernandez (of Casa Fernandez) have collaborated once more—this time introducing a new brand under the Casa Fernandez umbrella. Introducing Guardian of the Farm, a 100% Nicaraguan puro, using the legendary AGANORSA tobaccos exclusively. For Guardian of the Farm, the young blending duo built the theme around their dogs—the true “guardians” that vigilantly patrol the AGANORSA farms of Nicaragua. As such, the cigars bear a modernized canine emblem (not unlike Warped’s El Oso cigars), showcasing a new look for the traditionally old school Casa Fernandez brand. The series consists of three sizes: Campeon, JJ, and Apollo. Each size represents the names of the dogs themselves, owned by Max Fernandez, Eduardo Fernandez, and Kyle Gellis. As far as the cigars, the AGANORSA puro is selected from Criollo '98 and Corojo '99 crops for the filler, Corojo '99 for the binder, and a gorgeous shade-grown Jalapa wrapper of Corojo '99 varietal. The end result is a medium-plus body and complex flavor profile, showing big notes of Spanish cedar, citrus, sweet nuts, nutmeg, and a dash of red pepper. 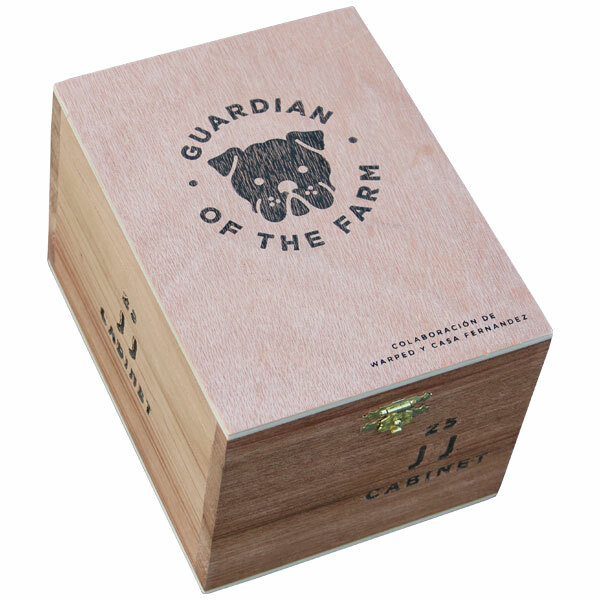 Casa Fernandez Guardian of the Farm earned the high honor of Cigar Aficionado’s No. 8 Cigar of the Year for 2017.